Blog Corcentric Completes Acquisition of Determine, Inc.
Cherry Hill, NJ, April 10, 2019 – Corcentric, a fast-growing provider of procurement and financial process automation solutions, has completed its purchase of substantially all of the assets of Determine, Inc. (OTCQB: DTRM), a leader in global Source-to-Pay and Enterprise Contract Lifecycle Management solutions. Nearly 300 executives from around the country came together for the two-day 2019 Corcentric Symposium in February at the Ritz-Carlton Orlando, Grande Lakes in Florida. Corcentric has been ranked as a Leader in the 2019 ePayables Technology Advisor research report from Ardent Partners. 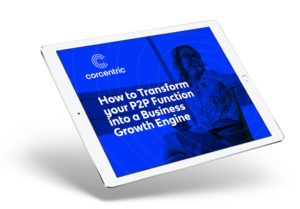 The results showcase a number of Corcentric’s strengths for mid-market and large enterprise organizations, including high scores with respect to smart invoice pre-approval validation capabilities and for companies looking for full P2P (procure-to-pay) capabilities. Corcentric today announced they have relocated their headquarters to better accommodate the needs of a rapidly growing organization. The company’s client base now exceeds 6,000 companies, reporting revenue of $103M in 2018. The new headquarters is located at 200 Lake Drive East in Woodland Falls Corporate Park in Cherry Hill, New Jersey. Corcentric today announced the acquisition of Netsend Ltd. Headquartered in London, Netsend offers electronic billing, invoicing, and document distribution services to the FTSE 100 and global blue-chip companies in over 50 different countries. The acquisition marks Corcentric’s expansion into the global e-billing market as a SaaS provider.